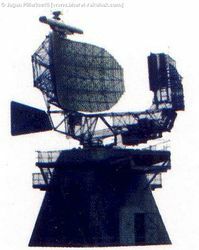 No.102 Squadron operates MiG-25 Foxbat KP-351 . 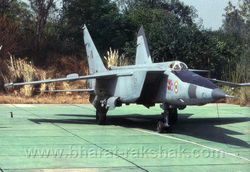 The aircraft, seen here on the Tarmac is the first single-seat MiG-25 in IAF's service. KP-351 in flight. Note the massive engine exhausts. A classic view of the Foxbat KP354 on the ground. 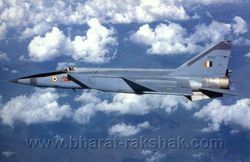 Peter Stienemann captured this classic photograph of a MiG-25 during the photoshoot for "Touching The Sky", the first Coffee table book on the Indian Air Force. KP354 banks away in flight. 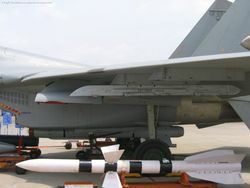 A shot of the MiG-25 banking away reveals the massive engine outlets and air intakes. 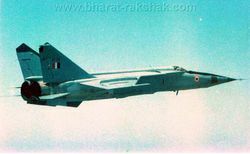 A MiG-25R, from the No.102 Squadron based at Bareilly, in flight. The pilots who fly this tri-sonic aircraft use space-style g-suits and helmets. Art work of the MiG-25R from the No.102 Squadron. 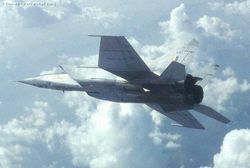 Art work of a MiG-25U; a two-seat aircraft used solely for training purposes. KP3106 is an attrition replacement. 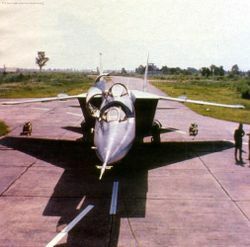 A MiG-25R (KP 3106) of the No.102 Squadron on the tarmac with other MiG-25Rs behind. 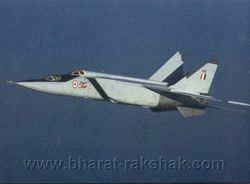 A MiG-25R (KP 355) flying over Bareilly. 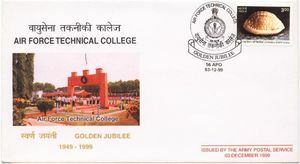 Notice the boxed-style canopy. 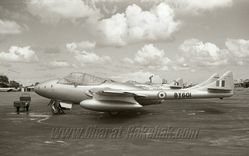 The aircraft is used for high-speed reconnaissance over 'sensitive' areas. 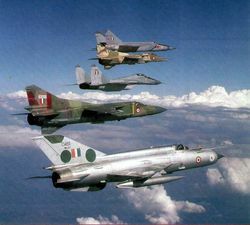 An Indian Air Force MiG Reunion: A MiG-25R (No.102 Trisonics Squadron) leads a MiG-27ML (No.9 Wolfpacks Squadron), a MiG-29 (No.223 Tridents Squadron), a MiG-23MF (No.224 Warlords Squadron) and a MiG-21MF (No.101 Falcons Squadron). 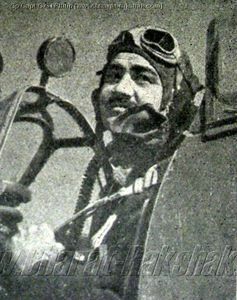 A Pilot of No.102 Squadron gets into the cockpit. 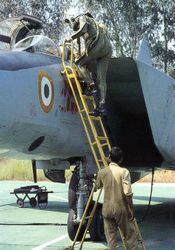 A pilot of No.102 Squadron gets ready to fly a MiG-25. 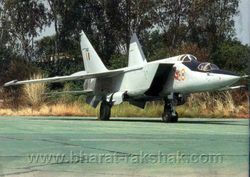 Over the 25 years of service of the aircraft, only 42 pilots of the IAF ever qualified to fly solo on the MiG-25. All set for a stratospheric flight. 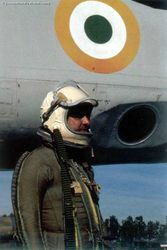 A MiG-25 pilot in his high altitude pressure suit stands besides one of the camera ports of his aircraft. 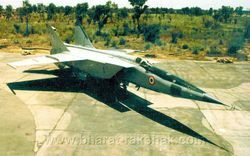 An early photograph of a MiG-25U of the Indian Air Force.